I've worn many hats throughout my life. When I was younger, I considered myself a runner--and a pretty good one at that. But I didn't start off good. In fact, I started off as one of the worst and would often be incapable of finishing races without walking. I got good over time by not "cheating myself," as many of my teammates did (and I'm sure these self-cheaters existed on other track and cross teams in junior high school and high school too). It wasn't my natural talent that led me to win dozens and dozens of races; it was my determination not to cheat myself (well, most of the time anyway). The first thought is often the best thought. This can be true, but there's a difference between a great thought and communicating that thought. Revision affords writers the chance to make their brilliant thoughts easier to see. Revision takes the "energy" out of the first draft. The energy in the first draft is felt profoundly by the writer. I know, I've felt it myself. It's comparable to runner's nirvana at times. But let me tell you: In most cases, the person who feels that energy the most is the writer. Don't mistake your elation in writing a new manuscript with the elation a reader will feel reading your first draft that hasn't been touched. For the reader, revision adds energy to the manuscript by making it easier to read. There are two main reasons I can give for why some writers are so revision averse. First, I think some writers are afraid if they revise that they'll never get that first draft back again. This, of course, is easy to remedy--just save the first draft in a separate file. The second reason is even simpler: I think some writers are just getting lazy and cheating themselves. Do I re-write every manuscript a dozen times? No. Have I had some pieces published that were exactly the same as the first draft? Yes. I don't think writers should start making changes just for the sake of making changes. That said, even those pieces that didn't change, I went over them probably a dozen times to look for imperfections that might make the poem better. Heck, I may have even tried re-writes and gone back to the original draft (I'm talking poetry specifically in these instances). But that's part of what being a good writer is. You build something; you try to knock it down; and if it holds up, you try to find an audience for what you've built. Now there may be writers who don't agree with this reasoning, but that's okay. They can decide to take the easy way out and avoid revision, but--as with runners who take short cuts or who don't finish off every run--they'll only be cheating two people: themselves and their readers (if they have any). It's been a while since I've posted about being a den leader. Over this past weekend, we finished off the first year with our banquet dinner. It was your typical scouting function in which the catering service never showed, but the kids still had fun while the adults grew cranky, tired, and hungry. But truth be told, (at least some of) the adults had fun too. 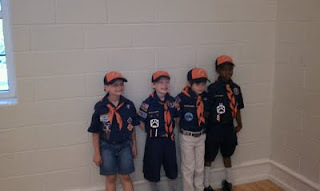 Four of my five scouts at our year-end banquet. Earlier tonight, I did the math, and it appears that my spur of the moment commitment to be Reese's den leader (for what I was thinking might be one year) may actually turn into a 10-year marathon of leadership. You see, Reese should be in Cub Scouts for five years (Tiger, Bear, Wolf, Web I, and Web II). The very next year after Reese graduates though, Will should be starting first grade--and his Tiger Cub year in Cub Scouts. Soooo...it'll be here we go again. But really, I'm not complaining, because I've had a great year for the most part, and I think it will only get better the more I get used to how everything works. Today, I updated my LinkedIn profile to include my position as a Cub Scouts Den Leader. My hope is that I've helped the boys engage with the world a little more while having fun. I know that I've learned a lot about myself and others by leading these first graders through activities and field trips. Volunteer organizations are well-meaning chaotic environments. The plan is always changing, things are always falling through the cracks, and balls are constantly being dropped. But it's not through lack of caring or effort. I've met a lot of truly caring individuals in my first year of scouting and though things can be frustrating at times, I know they put a lot of effort, time and energy into making things a little less chaotic than it could be. Leaders need lots of patience and adaptability. As mentioned above, things often don't go according to plan. So you can either get mad about it--and I'll admit I have lost my temper a few times--or you can focus on how to make the new reality work for you. The latter option is always preferable to the former. Leaders need to communicate effectively. Sometimes this means projecting my voice over a bunch of distracted 7-year-olds; other times, this means sending out e-mail newsletters to the parents of my scouts. I also had some ups and downs in communicating with the pack leaders, but see numbers 1 and 2 above. Leaders should ask for help. There were times over this past year when I tried to do things on my own, and there were times when I asked for help. Most of the time things turned out better when I asked for help. There's only so much one person can accomplish on his own. If you have resources that may be able to help, try and use them. I'm really looking forward to my second year as a den leader. Reese and I are already going through his Wolf handbook and completing requirements toward his Wolf badge. And yes, I've already sent out a Den newsletter to the parents that lets them know things they could be doing with their scouts over the summer. And yes, I'm already trying to think of ways to improve for the second year. One year down, four (or nine) more to go. And if you feel so inclined follow my blog by clicking the little follow button to the right there. Around the end of last year, I wrote a post about not raising red flags on yourself as a writer. It was all about not bringing up things that aren't relevant to pitching your story or placing your work. For instance, editors and agents typically don't care about your age, education, or gender--unless it's an important part of what you're pitching. Anyway, I recently received a comment on that post that got me thinking about how writers view themselves. Here's the comment from Joan A.: Writers should be building themselves and their work up, not putting everything down. As a psychologist, I find that self esteem is sadly lacking in the world today. Agressively confident. This writer knows he's amazing and wants every editor and agent to know this as well. In fact, he expects them to know this before he even bothers to pitch his story. I don't like to work with anyone who's significantly cockier than I am. Apologetic. These writers pitch stories as if they can't make eye contact and seem to apologize for all their shortcomings before the editor or agent even asks any questions. In fact, they almost seem to apologize for even bothering to write at all. As an editor, I can't trust a writer who can't trust himself. Most successful freelancers I know find a comfortable spot between these two extremes--both of which put the spotlight on the writer instead of the writing. These writers are confident in their abilities, but they don't take anything for granted. These writers keep their pitches focused on their stories instead of themselves, and that's the kind of confidence editors like myself want to see. During my time on this planet, the world has had a few predicted ends. While being raptured on May 21 would be nice (at least for those who are raptured), here's hoping we make it to May 22. Then, we can all get our focus back on 2012.
but I won't argue until it doesn't. As an editor, I get a first row seat to see how publishing is changing. Digital is shooting up and brick and mortar is struggling to stay level (or trend downward slower than competitors). Still, most of the money is in brick and mortar--at least for now. No one can accurately predict the future of publishing and media (except maybe Jane Friedman), but here's my attempt anyway on how I think eReaders may affect writers going forward. More than ever before, writers have the ability to experiment. In fact, the taboos against experimenting with various self-publishing models are collapsing like old monuments. Writers like J.A. Konrath and Amanda Hocking are showing that self-publishing can enable writers to make money like never before through digital downloads. All that's needed is a good story, a lot of hard work, and yes, a little luck (in that respect, things haven't changed so much). As eReaders get more advanced, writers may have the opportunity to create more interactive experiences and deliver audio and video. Each new technology improvement seems to make it even more vital for writers to develop an audience for their writing. (Here are some tips on what you can do today to build your platform.) The rise of eReaders offers no reprieve from this author platform momentum, whether you are self-published or published through a traditional publisher. If writers go the self-publishing route, they are the ones who create the content, format the content, distribute the content, and connect readers to the content. They wear many hats, and have to brand themselves as businesses. Traditionally published authors may not have to format or distribute the content, but they still need to create and help connect readers to the content. Publishers will do their part through professional editing and design. They'll also use their sales force to get your books in bookstores. But to really sell books, especially digital books, publishers need their authors to spread the word and connect with their core audience. As I mentioned, the importance of platform building is not a new development, but it's only gaining momentum. Publishers aren't just asking whether a book proposal is good or not, they're questioning the reach of the author, and this can affect everything from the size of the advance to whether the project is even ultimately accepted for publication. So do eReaders affect how writers attack their actual writing? In the short term, I don't think it's had a huge impact, but it's easy to see how economy of language should only increase over time. Nonfiction writers will probably need to apply a blogging mentality to their writing. That means a lot of links to other information. Some poets have objected to how eReaders affect the formatting of poems. Since there's not a whole lot of money in poetry, I don't know how this will be fixed. If it's not, eReaders may not change poetry, but prose poets and short-line poets may find that eReaders suit them better than others. I'm really interested in how fiction might be affected by eReaders. Will shorter works sell better? Or will size not matter? One thing digital does seem to enable is a great launching area for super long debut novels and/or shorter novellas that might not work in traditional, brick and mortar publishing. In many ways, I feel that the business of writing and being a writer isn't going to change a whole lot. The craft of writing is always evolving (compare Charles Dickens against the current bestsellers lists, if you don't believe me) and so are the delivery methods for that writing. Ultimately, the changes may be a good thing for writers and readers. Successful writers will continue working their butts off to provide content that readers want and finding ways to connect with those readers. Such writers always seem to find a way to make their own luck no matter what technology throws their way. We're about a month from the scheduled delivery date, so I entered this weekend feeling we should really figure out our daughter's name so that we don't end up blanking on a name in the delivery room. So the name is one thing, but how did we arrive at the name? Tammy and I had dozens of boy names ready to go, but for some reason, we just couldn't come up with any girl names. Finally, we asked Reese if he had any ideas for his little sister's name. His response was Hannah. But I admit I initially balked at giving a name that's spelled the same forward as backward. Plus, there's Hannah Montana. And Hannah rhymes with banana. But we didn't rule Hannah out. For one, it is a pretty name. For two, we didn't have any better options--unless we wanted to give her a boy's name. Then, we went to church this morning and the scripture was 1 Samuel 1:3-8, which is about Hannah's faith in the Lord against hard times. The only bigger sign we could've received is for an airplane to spell out the name Hannah in the sky. With Hannah figured out, I thought of the middle name Marie, but I didn't want to suggest it. My mother's (and her mother's) middle name is Marie, and I didn't want to pick a name that was just from my family. So, I suggested Nicole, which Tammy liked too. After an hour or so, I realized that Nicole wouldn't work, because Hannah Nicole sounds a little too much like Anna Nicole. Tammy and I put our middle name hats back on, and I kept coming back to Marie, but I didn't want to suggest it. There had to be another name that worked. Finally, Tammy said, "I think you had mentioned the name Marie before. That's my Ma-ma's first name, and it's your mom's middle name." As usual, Tammy and I were thinking the exact same thing. "Perfect," I said. And so now the little girl has a name, and that name is Hannah Marie Brewer. The only thing we can do from here on out is wait for her to enter the world. Wondering what Hannah Marie means? Hannah means "God has favored me with a child" or "gracious." Marie has debated meanings, ranging from "bitterness" to "wished-for child," or even "beloved." And we just learned from Tammy's father that his father's mother's maiden name was Hannah. So, the name is becoming even more perfect. The Baby Name Wizard: A Magical Method for Finding the Perfect Name for Your Baby , by Laura Wattenberg. Hannah Montana Forever: Final Season DVD. Marie: A True Story DVD. 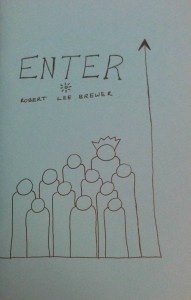 On April 1, I officially released my self-published poetry chapbook ENTER. Before the month was over, I'd already sold out--and not just to friends and family. Copies of ENTER are either at or on their way to nearly all 50 states and quite a few countries, including Canada, Mexico, Ireland, Germany, Israel, Australia, and India. Today, I had to turn away my first would-be buyer, because all the copies are claimed. In this post, I'll detail what I think I did to sell out the collection within a month of the official release. It took more than 17 years and 10,000 crappy poems to finally assemble the 21 poems in ENTER. It all begins with the craft, and I've been filling up composition notebooks with crappy poems for more than 17 years now. I'm fairly certain I've written more than 10,000 poems in that span. Out of that spectacular wave of failed verse emerged the 21 poems that comprise ENTER. The writing comes first, but a poet (or any writer) can start building an audience on Day 2. In high school, I'd fill composition notebooks with my poetry and pass the books around to my friends asking for them to indicate which ones they liked best. I used their input to help me figure out what appealed to my target audience. In college, I signed up for creative writing courses, which are heavy on the workshopping, and I read at a few open mics (shy as I am). Post-college, I was flung into speaking and then jumped at the chance to blog about poetry at Poetic Asides. If it weren't for the audience I'd already built, I probably would not have had the courage to attempt releasing ENTER. So while the writing is important, so is having a readership to share it with. I've known for a long time what I like and don't like in poetry collections--just the presentation of them. And for poetry chapbooks, I really like the old fashioned foldover variety without too much in the way of flowery design elements. Actually, my wife Tammy was lucky enough to have two very good chapbooks published through Rose of Sharon Press and Verve Bath Press. Anyway, I wanted something simple and personal to share with my readers. That's what I think ENTER is. It's hard to sell out if there is no finish line. I didn't know what to expect when I set my limited edition at 101 copies. Now that I've sold out before finishing the first month, I'm wondering if I set the bar too low, but I may have picked the perfect number. After all, there are now 101 copies of ENTER that are perfectly personal and unique. I can get more ambitious next time around. The official release date was April 1, which I chose because I had two writing events lined up for early April: the Blue Ridge Writers Conference and the Austin International Poetry Festival. However, I didn't wait until April 1 to start building excitement about the project. I made my first announcement on December 15, followed by an update on December 21. On January 6, I began accepting payments for pre-orders. I think I had nearly half the copies claimed by April 1. And those are the main reasons I think the collection went as fast as it did. In future posts about the collection, I hope to cover kind of the back-end process and lessons learned. In the meantime, read this super sweet review of ENTER from Maureen Doallas. The last few weeks have been a blur for me. As I was finishing up the April PAD Challenge on the Poetic Asides site, I was also trying to hit some book deadlines while putting out the daily fires that go along with being an editor for a media company. Then, I got sick. Really, really sick. Break out my time machine. This is how most overworked editors are able to meet incredible deadlines. Well-kept secret. Or at least until I just ruined it for all the other editors by saying something. Streamline my work process. Since I have a pretty streamlined process already after more than a decade of doing what I do, streamlining is slang for letting go of things that I can't get to--at least in the short term. That means, for instance, that I won't be assembling a full-length collection to submit to poetry contests anytime soon. C'est la vie! 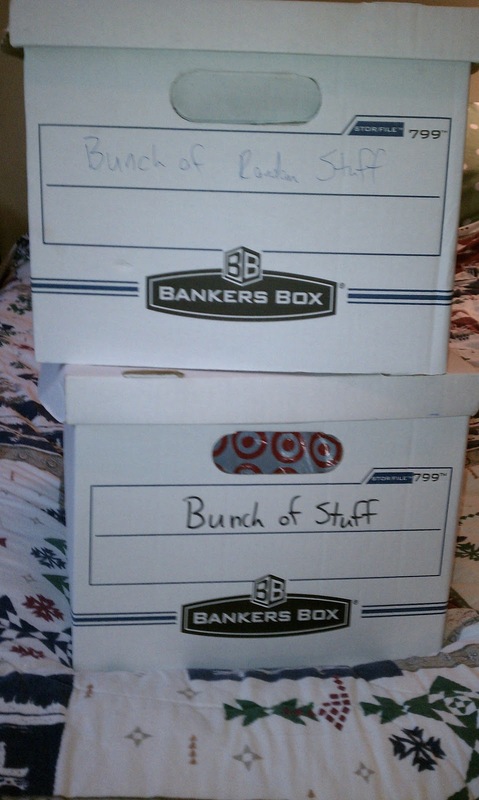 When you can't even come up with specific labels for your boxes, then you're ready to let go of the "stuff." Junk. Might seem obvious, but many people (myself included) keep the dumbest stuff. Do I really need an old pumpkin carving kit and broken calculator? What about these old lists that are obviously from before Will was born? I need to throw it all out or dump it on someone else. Old food. This doesn't mean just the food that has gone bad in the fridge, though that's a great place to start. Maybe you have canned food that lasts until the year 2020, but that you've had for four years without the slightest urge to consume. Time to cut the chord. Clothes. I know, I know. We might all lose weight (or gain it, I suppose) eventually, but if it's been more than a year since I've fit into a pair of pants, then I should move on. If I lose that weight, I can celebrate by buying myself some new jeans. Books. Eeek! How could I recommend letting go of books? 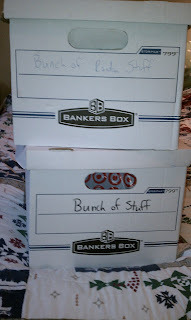 My rule is that if I have to pack books into boxes, then I should get 'em out of the house. This could mean taking them to the used bookstore or giving them to a friend who might enjoy a good read. I've moved several times, and it's them there books that always break my back. Toys. As a former kid, I value the importance of toys. As a parent, all I see is clutter-clutter-clutter. Big time. I don't even know why I buy kids meals for the boys, because those are always the first to go when I do a toy raid. E-mail. That's right. It's important to let go of e-mail too. Unless an e-mail is super duper important, I like to delete everything that gets to be older than a year. And I regularly delete e-mails from my deleted folder, because I believe in deleting things that I've already deleted. Expenses. This is a difficult one, but I try to take a hard look at my expenses every so often and cut what isn't needed. Of course, I do this on paper. In the real world, I sometimes "forget" that I shouldn't be spending $2 for a liter of Mountain Dew or $7 for a meal from Wendy's. But I'm always trying. Grudges. A lot of people have done a lot of horrible things to me over the years. But I know I'm not perfect, and that I've stepped on toes and hurt feelings over the years myself. If you have trouble with letting go of things, I hope you can at least put some effort into this one. Forgive people who do you wrong. It will only make you happier with all the other stuff that's surrounding you. Letting go of things can be scary and intimidating at first, but once you start releasing yourself from clutter, it can get addictive. It's totally liberating! Kindle . What a great way to collect literature without collecting dust. Sony A390 Digital SLR Camera . Digital cameras are the way to go anyway, but this one's received great reviews. Classics , by Ratatat. Just some very cool instrumental music with sweet beats and even sweeter guitar riffs.